Today is the last Monday in May, which means, since first observed in 1865, is Memorial Day. Memorial Day is not only the signal to begin summer vacation for some, a 3 day weekend excuse to get together for others, but most a day of remembrance for fallen Military personell for all. As long as there are people who survive lost love ones in the line of military duty, we will never forget. Happy Memorial Day. 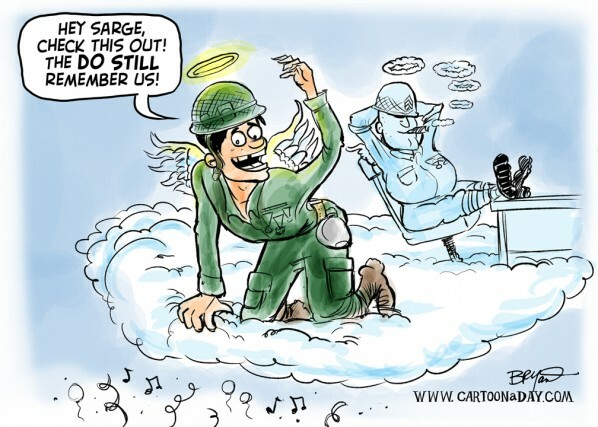 Editorial cartoon featuring Memorial Day, fallen soldiers and G.I. 's gone to heaven. Happy Memorial Day.